In Australia, for many years, a sprig of rosemary was the symbol of remembrance to commemorate the disastrous Gallipoli landing at ANZAC Cove at dawn on the 25th of April 1915. Proudly displayed on military and civil clothing alike, rosemary was, and still is, found growing wild in the hills that overlook the beach on the Gallipoli peninsula, and thus the connection flourished. 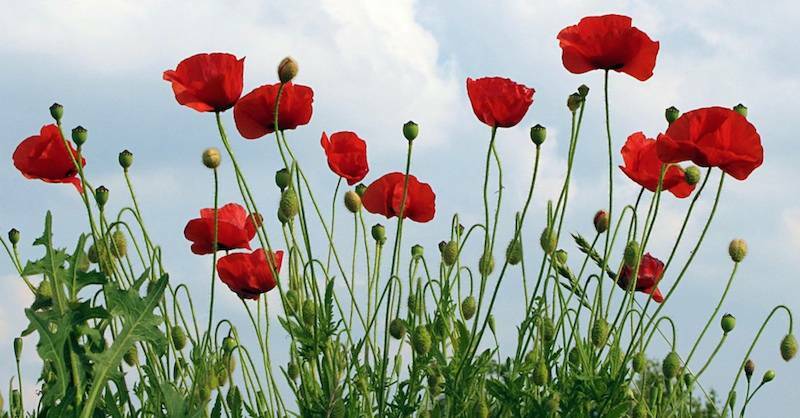 The humble poppy was generally associated with Remembrance Day on November 11. Today though, in ANZAC Day marches across Australia and New Zealand, the poppy has taken precedence. But where does the association begin? While poppies also grow in abundance among the rosemary bushes on the heights above ANZAC cove, they were also prevalent on the battlefields of First World War Western Europe. Amidst the muddy carnage of trench warfare where earth was regularly displaced by an incessant barrage of artillery fire, soldiers would notice that practically the only flora that could thrive under these adverse conditions was the Papaver rhoeas, or poppy. An American academic named Moina Michael, inspired by In Flanders Fields whilst volunteering on the WWI battle lines, wrote her own poem and vowed to remember the fallen by making, wearing and selling replica silk poppies. Popular across Europe, the idea was brought to England where the newly formed Royal British Legion ordered 9 million poppies, raising over 100,000 pounds on November 11 (the date the First World War ended), 1921, to help veterans of the war. From there the tradition grew with each year; the proceeds garnered from selling the poppies distributed to aid veterans of all conflicts. Today they are widely used in the United Kingdom, Australia, Canada and New Zealand to commemorate those men and women who paid the ultimate sacrifice on Remembrance Day.